You know the saying "What ever happens in Vegas, stays in Vegas", well I guess I will have to break the rules this time in order to share about this fabulous restaurant that I tried. 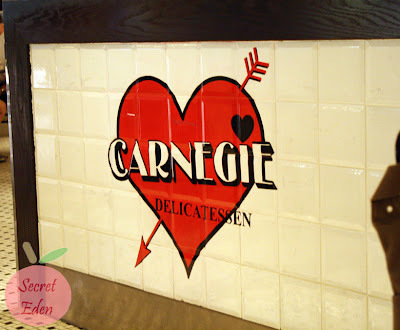 Actually I wasn't even aware of Carnegie Deli until Kim blogged about the original one in New York. Thank God for franchising, because I wasn't heading to NY anytime soon, so I was excited to find out that they a location inside the Mirage hotel. After an excellent Cirque show 'Love', R and I decided to get a quick bite to eat. Since we were already at Mirage, we immediately thought of Carnegie Deli. The deli first opened in 1937 right across from Carnegie Hall, hence it's name. Nowadays, it has become an iconic landmark and a tourist attraction, where the lineup is down the block. Good thing it' wasn't so crazy in Vegas, cause we only had to line up for about 15 minutes to get a table. All meal are served with a dish of their very own pickles. I must be honest, I am not a big fan of pickles. These were crunchy but quite acidic. We only intended to eat something small, but that was just not possible here. R ordered the 50 Ways to Love Your Liver ($17.95) and it was one tall sandwich. The grounded liver was rather coarse. Because of the nature of liver(high fat content), it's really hard to consume a lot of it. In the end, it was liver overload and R only managed to finish a little more than half of the sandwich. Knowing that their sandwiches are huge, I opt for a freshly grounded Turkey burger ($10.95) instead. Even this was a pretty big portion in my opinion. The grounded turkey and vegetable patty tasted fresh and juicy. However it was a bit burnt on top. I proudly announced that I finished it, but it was one filling meal. People say women have a separate stomach for dessert, I say it's more like greed. After noticing that they have cheesecake, I just couldn't resist. Even though the food was more than enough, I still ordered a slice of Blueberry Cheesecake ($9.25). R and I literally took 1 bite each, and the rest was packed to go for breakfast. The NY style cheesecake was very thick. It was topped off with some blueberry compote. The cheesecake itself was creamy, rich and dense. Personally, I like lighter cheesecake, but if you like NY style, then definitely give this a try. Nowadays, in flight meal options are really crappy. So right before we left Vegas, we decided to head back to Carnegie for some filling lunch, and figured we will probably have left overs to take on the plane. This time R chose the Club Dear ($22.95), and once again the size is just crazy. A lady walked by and said "Let me know when you figure out a way to bite into that". You know I did wonder at first why they gave us fork/knives for a restaurant that serves mostly sandwich (hehe). The toasted bread was tasty. The bacon was crispy and over roasted turkey was moist. Overall, this was one good sandwich. Of course, I had to get their most popular sandwich : The Woody Allen ($17.95). This is one meaty sandwich which consisted 1 layer of corn beef, and 1 layer of pastrami. Given that there were only 2 slices of bread for all that meat, I was concerned that the meat might be too salty. However that was not the case, the meat just right and quite tender too. The only thing I didn't like was the bread, as it was not toasted like the Club Dear. Overall, the sandwiches here are delicious. However there is a problem and that is its size, because anything good turns bad once you have too much of it. But I guess the size is also one of their main selling point. Would I come back? Of course, but the next time around, I will definitely consider sharing, as one whole sandwich is just too much. (additional $3 for sharing). Jenny! I can't believe you got a TURKEY BURGER at Carnegie Deli! LOL. But, at least you went back to get pastrami.